And so the adventure begins...my first trip to Africa, and going solo. Day 1 was essentially a travel day, slowly making my way from Oxford to Marrakesh. It began with a quick cab ride from Littlemore to the downtown Oxford bus station, and then a relatively long 2-hour ride to London-Gatwick airport (thank goodness for Sudoku). I had about 3 hours to mill about the airport, so had some lunch, studied the bird guide a bit, and tallied five species from the airport windows: Common Wood-Pigeon, Eurasian Blackbird, Common Buzzard, and Eurasian Magpie. At 3:40pm my EasyJet flight departed on time, and landed ahead of schedule thanks to a strong tail wind. It was quite strange watching the sun set for nearly the entire flight, as we essentially flew down the edge of the sunset bell curve. Once in Marrakesh, my luggage was there to meet me (unlike in the UK), getting through customs was relatively easy, and renting my car was painless. It was the next hour-and-a-half that didn't go so well...I had pre-programmed all of my destinations and routes into my GPS before leaving Canada. My hotel, based on the information I had, was just 3 kms from the airport. However, when I arrived at my destination, my hotel was nowhere to be seen. After searching the immediate area intensely, asking for directions (what man does this? ), and then finally relying on my iPhone to navigate, I found it...or so I thought. The hotel had the right name, but it turned out I was in the wrong district. The hotel operator there did however provide me with a hand-drawn map to the correct location, and after another 30 minutes I was at the right hotel. I was thankful to finally settle, without any major incident. Day 2 and my first full day of birding in Morocco. Today's plan was to head to a ski hill at Oukaimeden in search of two key species: Alpine Chough and Crimson-winged Finch. I woke at 6:10am and departed the hotel at 7:10am, about 15 minutes before sunrise. My day began with some common European birds on the hotel grounds, including Pied Wagtail, Chaffinch, Blackcap, and European Blackbird. For the first several miles, or about half the trip, driving was along a relatively fast and straight road. At Douar Ouriki I saw a Common Stonechat, and in the village of Trine I saw my first lifer for the trip, Common Bulbul. Also in Trine was another Blackcap, and Chaffinches of the African race. At Trine I turned off to begin the long climb up the High Atlas to Oukaimeden. Birding was slow going, and almost every possible pullout had somebody selling something. And if a pullout had nobody selling anything and I chose to pullover to scan for birds, it wasn't long before someone pulled up on their motorbike with something to sell. At Tinichchi I found another two Common Bulbul's, as well as two Rock Bunting's, and a Black Wheatear. I arrived at Oukaimeden with great expectations a little after 10:00am. Unfortunately, expectations were soon crushed by the swarms of people, especially the numerous peddlers pushing their wares. I spent about an hour at the resort, pulling over to scour the land wherever I could get a bit of peace. I couldn't for the life of me find a Crimson-winged Finch, so that was a huge disappointment and my first big miss. I did however get Alpine Chough, about 40 of them mixed in with the even more numerous Red-billed Chough, and so managed to get one of two target birds. The only other species with decent numbers was Horned Lark (14 of them), among which was a single Linnet. At Oukaimeden Lake, which was completely open, I observed a lone White-throated Dipper foraging at the mouth of a small stream that flowed into the lake. This was my third lifer for the trip, and a pleasant surprise. With several more hours to spend birding, and Oukaimeden decidedly not being the place to do so, I began to make my way back down the long and winding road, now playing it by ear as to where to go. Just past Tinichchi was a road heading west, referred to as Route de Farthing. I had no idea where it went, or what to expect, but with about 4 hours to spare I went for a "country drive". 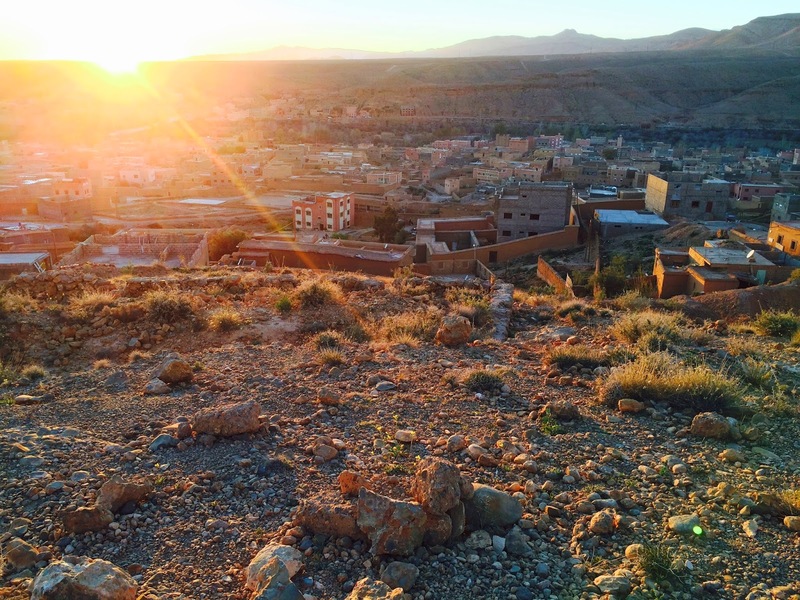 I eventually ended up in Tahannout, a mid-sized village in the lower foothills of the Atlas Mountains. It was here that I decided to turnaround and head back to Tinichichi. On the journey west I added few species to the trip list...the best bird was a Sardinian Warbler. At Tannahout I added White Stork, and on the journey back east I added Mistle Thrush, Firecrest, Red Crossbill, and Greenfinch. Back at Tinichchi I decided to give Oukaimeden one last chance, but by the time I got up there, about two hours before sunset, the birding was even worse. Now I could only find a few Red Choughs, and so I gradually made my way down the hill and to Ait Outir, my destination for the evening. Day 2, and hopefully things would go better than yesterday's weekend visit to tourist-central. I woke at 6:30am, had a wonderful breakfast of pastries and jams with coffee, and started birding as soon as it was light. The hotel grounds turned out to be quite productive, and what I thought was my first lifer of the day, a Helmeted Guineafowl, turned out to be a rather free-roaming bird of likely domestic stock. Helmeted Guineafowl was declared extirpated from Morocco in the 1970s, and so I thought I`d hit the jackpot. But thanks to the rather kind feedback from @MoroccanBirds, I had not made a major discovery. See here for an interesting discussion on the topic. I did however still manage to add a lifer from the hotel grounds, which was a very cooperative House Bunting. There were also numerous Common Bulbul's milling about along the riparian vegetation. From Ait Outir I headed east toward Toufliath, where once again I had a specific target bird I wanted to see, Levaillant's Woodpecker. Before arriving at Toufliath however, I did see some excellent birds along the way, including my first Moussier's Redstart and Black Redstart, lifers five and six respectively. At Toufliath I was again somewhat disappointed by the circumstances. The only place to pullout was at the side of the highway, the only major road in the area that crosses the High Atlas. Every few seconds loud cars and trucks bellowed by, making the birding difficult. I spent about an hour at the site, hiking up and down both sides of the road scouring every tree and branch for signs of movement. I even walked slightly up into the forested hills, but seeing several well-used trails I was certain that many led to private residences. I unfortunately did not locate Levaillant's Woodpecker, but I did add Short-toed Creeper to my life list, and saw only my second Great Spotted Woodpecker (two of them). Disappointed with not seeing Levaillant's Woodpecker, I continued my journey east from Toufliath to Taddert. Along the way I spotted Black Wheatear, another Moussier's Redstart, European Serin, and several Pied Wagtail. After Taddert I began the very long and winding climb through the Tizi-n-Tichika pass...an impressive single-lane road with precipitous drops and little in the way of safety guards. Of course, at the top of the pass where barley a plant can survive, was the ubiquitous pottery and rug peddlers. Birds at the pass included only a few Red-billed Choughs and a Pied Wagtail, but the scenery was amazing. From Tizi-n-Tichika Pass I made my way downhill about 2000m to the city of Ouarzazarte, where a much lower range of hills and moutains (knows as Jbel) lined each side of a vast plain. At Ouarzazarte I added my last lifer for the day, White-crowned Wheatear, and on my way to Boumalne Dades I saw another five individuals of this handsome species. Also along the way I added Northern Shrike and Crested Lark to the trip list. I arrived in Boumalne Dades at about 3:30pm, with about 20 minutes to spare before sunset. Boumalne Dades is located at the eastern end of the Dades Valley, and lies between the Central High Atlas and Jbel Sarhro. The vast plain that lies between these mountains was my destination for tomorrow's birding, with several desert specialties on the "hit list".